In the 1960s, a team of excavators uncovered the ruins of the ancient city of Lambityeco (AD 500-850), in what is now Tlacolula de Matamoros, Oaxaca, Mexico. In a recent return to the site, the discovery of a carved stone crocodile by Field Museum archaeologists has provided a key to revising long-held ideas about the site. During the early excavation, archaeologists unearthed seemingly conflicting evidence. On the one hand, they found a palace with iconic frescoes that indicate the close connections between Lambityeco and nearby Monte Albán, a much larger urban settlement in the region. However, not all of the pieces recovered during this study seemed to fit this narrative. Some of the artifacts showed marked differences with those from Monte Albán. Because of these differences, the archaeological team attributed Lambityeco to a later time period than Monte Albán, an interpretation that stood for decades. Nevertheless, more recent reanalysis of materials from Lambityeco has shown that the site was actually contemporaneous with Monte Albán, leading to new questions. Over the last four years, new excavations led by Gary Feinman and Linda Nicholas of The Field Museum (in conjunction with Mexico's National Institute of Anthropology and History) have expanded the investigated area at Lambityeco, and their discoveries have yielded a richer history than was originally thought. When the civic-ceremonial area of Lambityeco was first settled, the public buildings were clearly laid out in a manner closely reflective of that at Monte Albán. Yet, during the occupation, a major reorganization in the use of space occurred in the ceremonial core of Lambityeco. The architecture was remodeled so that it no longer reflected the construction patterns at the larger site. This shift likely reflected a distancing in the relationship between the two Valley of Oaxaca centers. "During this time period, the relationship between Lambityeco and Monte Albán shifted," said Field Museum MacArthur Curator of Anthropology Gary Feinman. "The people of Lambityeco began to remodel their buildings and reorient the use of space in order to differentiate themselves from Monte Albán." Evidence collected over the past four years has helped illustrate this change. One key feature that changed at Lambityeco was its ballcourt–an important structure for both ceremony and recreation in prehispanic Mesoamerica. In its original design, the ballcourt at Lambityeco, which was discovered by the Museum team in 2015, was laid out in a very similar pattern to the one in Monte Albán: both were constructed with the same orientation and were entered from the north side of the court. However, less than two centuries after the ballcourt was created in Lambityeco, the people sealed its north entrance and created a new stairway on its northeast corner–a major shift from the layout at Monte Albán. At this same time, the frescos in the palaces, excavated in the 1960s, were covered over, and never re-created again. Another piece of evidence that helps illustrate this change at Lambityeco is a large stone carved on three sides with an image of a crocodile that was discovered during this recent field season. 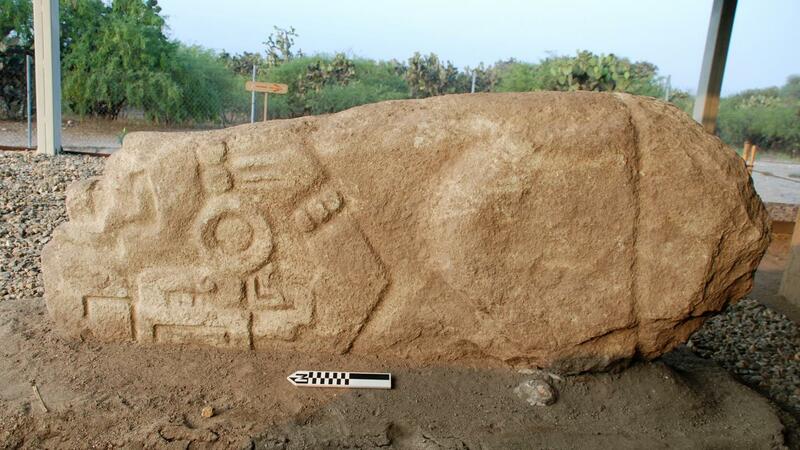 This is the largest carved stone found to date at Lambityeco. Although similar crocodile stones have been found at other sites in the Valley of Oaxaca, this was a unique discovery. Not only was it one of a few carvings of its kind to be discovered still in its prehispanic context, but the Field Museum team also found that the stone was moved from its original location during the long-ago occupation of Lambityeco. "We believe that this crocodile stone was originally a part of a stairway leading up to a temple at the heart of the civic-ceremonial center of Lambityeco," said Linda Nicholas, archaeologist at The Field Museum. "However, when the people reconstructed the core area of the site, the entrance to the temple was blocked and the stairway was dismantled." As new evidence continues to accumulate from Lambityeco, questions continue to arise. What caused this political shift between Lambityeco and Monte Albán? What is the full extent of architectural changes made within the city? Although, anthropologists continue to work on answering these questions, it seems like one fact remains true. In its short-lived history, Lambityeco was a center of significant importance that still holds many clues to understanding the rich prehispanic history of the Valley of Oaxaca.